If you have always wanted to add heated seats to your Motorcycle, Snowmobile or Boat, then this is your kit. This is the latest in Carbon Fiber Seat Heating Technology. These pads are a Quantum Leap over the previous generation of Carbon Fiber pads. The wide carbon fiber strips are sandwiched between a pliable waterproof cover that can be trimmed with a scissor (standard also available). These wide Carbon Fiber Strips have approximately 300% more Carbon Fiber material then the previous honeycomb Carbon Fiber pads which gives you ~300% more heating surface. Do not confuse these elements with other seat heater kits that claim to be waterproof as long as you put plastic over them (another words your digital camera is waterproof as long as you put it in a plastic bag!). Carbon Fiber technology is the best seat heating pad material in the marketplace. The first reason is that Carbon Fiber thread is pliable and a good conductor of electricity which can be designed to incorporate a variety of shapes which are interconnected and form a grid which can be sewn over. Carbon Fiber will not corrode or break like copper heating elements. Second, this Deluxe Universal Seat Heater allows the installer to trim the length of the carbon fiber pads or to cut holes in the center of the pads to accommodate any seat design or seat sensor and still provide heat. Pads are cut with regular scissors or razor blade to create any pattern to fit any seat. Third, the Parallel heating fibers ensure long life and dependability. With conventional, serial seat heaters, any abuse that breaks the heating wire shuts off the entire heater; the same abuse would only render a small portion of our heater inoperative so the driver will still be cozy and warm! Fourth, the heating elements are completely waterproof & most of the pad (except where power is supplied) is puncture proof. Fifth, Ultra-thin carbon fibers mean no bulky and uncomfortable wires. Other than the soothing warmth there's nothing to make the driver or passenger think their seats are out of the ordinary! 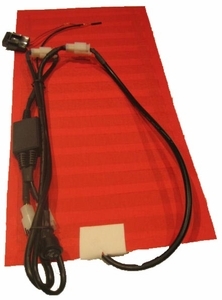 This kit will install in any seat with a 12 volt electrical system. This kit is for a single seat's bottom or back. The single pad kit is designed to install between your seat upholstery and the padding underneath. Installation may require removal and re-installation of seat and seat covers. Peak Deluxe Heated Seat Kits are equipped with the latest Switch Technology. Illuminated 2-Color Dual Temperature High/Off/Low Rocker Style Round Switch with waterproof cover. An electronic control module (built into wiring harness) regulates the electricity / temperature circulating within the carbon fiber seat heating pad. This system regulates the flow of power in micro-pulses and maintains a narrower temperature range whether in a high or low setting. Example: The high setting will have a constant range between 120°F to 125°F. The low setting ranges between 110°F to 115°F. These respective temperatures are maintained at these respective levels. By timing the electrical pulses instead of using a conventional rheostat, less energy is consumed by the controller and more is available for the heating elements. Pad is approximately 1/32" thick. Length can be trimmed to any size with any scissor, width cannot be trimmed and has to stay at 9"
Peak Deluxe Heated Seat Kits allow you to get rid of unwanted seat heater wiring when you install switches on the side of the seat. Our seat heaters are equipped with quick-release connectors that can reduce your wiring length by 36" eliminating the need to tie up and hide a bunch of wiring. You should start to notice the effect of heat within the first 2 minutes of starting the system in the High temperature setting. Current Draw: 2.5 Amps on Low Heat Setting and 3.5 Amps on High Setting. 2 Wire Installation (Red to 12 Volt Positive & Black to Ground) Everything plugs into each other. If removing the seat cover seems complicated or you are unable to find a local auto upholsterer, then please check out this heated seat covers that slip over your seats.